On February 16, 1868, a small group of kindly warm-hearted men met in a boarding house on Elm Street in New York City. They were actors and entertainers who were members of a social organization called the Jolly Corks. After much discussion they decided to change the purpose of their little club and become a charitable fraternal association. The end of the Jolly Corks and the birth of something new and greater was at hand. That night the Benevolent and Protective Order of Elks was born. From the beginning the Lodge was plagued with the difficulty of finding a permanent headquarters. After holding their first meeting in the Odd Fellows Hall, they met in three other buildings, but were not happy in any of them. 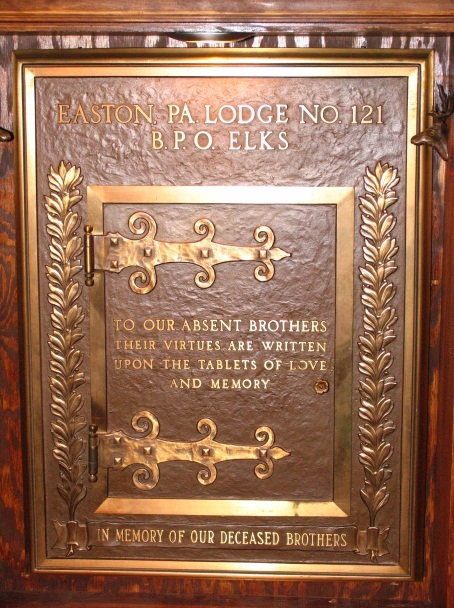 They decided that it would be necessary to build their own Lodge hall, and so a resolution was passed to float a bond issue for twenty five thousand dollars for the construction of a building that they could really and truly call “ The Elks Home.” The cornerstone was laid in 1908 and the building was finished in 1908. 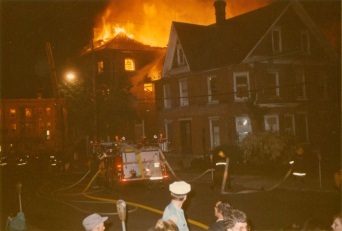 It was erected at 120 Broadway and with periodic renovations served as the headquarters for Elkdom in the Slate BELT area until it was destroyed by a disastrous fire on May 20, 1974. For the first time since 1908 the lodge was homeless. When it looked as though everything was lost, the local chapter of the Knights of Columbus allowed the Lodge to hold it’s meeting’s in their hall in West Bangor, the East Bangor Lions Club allowed the Lodge to hold it’s weekly bingo game in their hall, Sayre Elks Lodge No. 1148 loaned the Lodge a set of officer’s jewels to use, and East Stroudsburg Lodge No. 319 allowed the Lodge to use their lodge hall for initiations and other special meetings. Bangor Lodge knows what brotherly love is all about. Despite the loss of the home, the work of Elkdom continued in the Slate Belt from temporary quarters on North Eighth Street in Bangor. 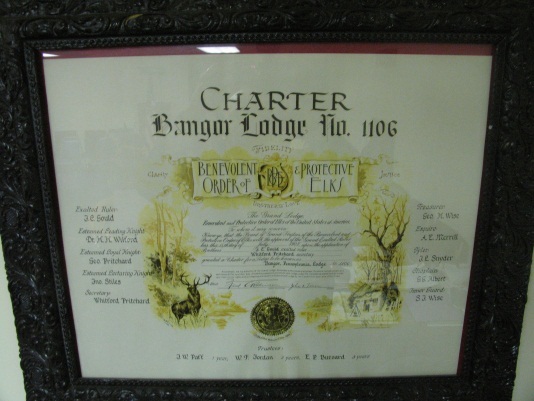 It is important to recognize that the officers and members of Bangor Lodge realized that an Elks Lodge is not a building, but consists of dedicated hard working Elks. The Present hall was constructed at 120 Broadway on the foundation of the original building. 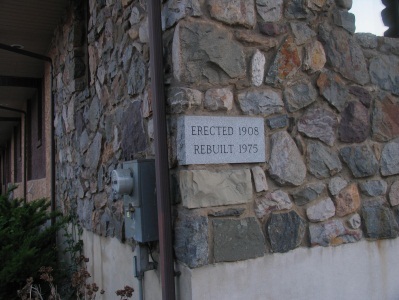 It was finished and dedicated in 1975, and it too has served as the headquarters of Elkdom in the Slate Belt area. As time passed it became apparent that the new building was not large enough to meet the needs of the Lodge and in 1990 – 1991 the building was enlarged to its present size. The primary object of the Order of Elks is the practice of charity in it’s broadest sense, not merely that of giving money. The major project of the Pennsylvania Elks State Association is its Home Service Program which provides nurses in mobile units across the state to serve people who are developmentally disabled. Since this program began forty-four years ago with one unit and a $25,000 grant from the State Association it has grown to twenty-four units with an annual budget of over one million dollars. Its services are available at no charge to the clients. Bangor Lodge has been a leading contributor to its fund raising activities. The National Welfare Program of the Order is directed by the Elks National Foundation, unique among philanthropic agencies in that the entire income of its investment fund is spent each year for charitable purposes. The fund is raised wholly through voluntary gifts and many members of Bangor Lodge are participating members of the Foundation. While Bangor Lodge actively supports all of the Grand Lodge and State Association programs it is also involved in many projects on the local level. From Christmas charity baskets, Eagle Scout recognition, Little League baseball, local scholarships, to assisting the high school band make a trip to Wales, and helping to finance a new roof on the Bangor Public Library. These are just a few of the local projects in which the Lodge is involved. In 2003, a group of Past Exalted Rulers from Easton Lodge No. 121, approached Bangor Lodge asking if they would consider a merger of the two Lodges. Both Lodges voted favorably on the proposal, and the Grand Exalted Ruler issued an Executive Order creating the merger. This not only increased the membership of Bangor Lodge, but also increased the size of the Lodge’s jurisdiction and financial resources. The merger has proved to be beneficial to both Lodges. Perhaps the best known activity of the Bangor Lodge is the annual Elks Variety Show, which is a fundraiser for many of the Lodge projects. Originally the Bangor Lodge sponsored a minstrel show. The first show was in 1934 and continued until it was interrupted by World War II. The show was revived as a variety show in 1961, and since then has been entertaining Slate Belt audiences. It is very appropriate that the Elks should sponsor a show of the kind since the original members of the Order were actors and entertainers. The services rendered by Bangor Lodge to the area within its jurisdictional boundaries have been outstanding. The principles of Charity, Justice, Brotherly Love and Fidelity have prevailed in the Slate Belt for the last one hundred years. Bangor Lodge is proud of its accomplishments. One hundred years is in itself a reward, but it also imposes a challenge for the present leaders to carry on. Bangor Lodge No. 1106 on its centennial anniversary is already working towards it’s next one hundred years – A NEW CENTURY OF SERVICE.